THIS MAGNIFICENT DISPLAY IS MADE WITH RED, WHITE, BLUE & GOLD GARLANDS AND IS LIGHTED WITH 1,757 C-7 COLOR MATCHED INCANDESCENT LAMPS. 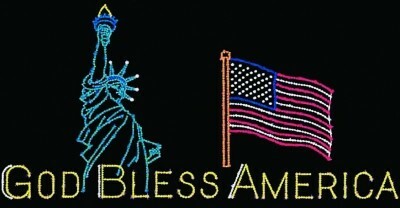 INCLUDES STATUE OF LIBERTY, AMERICAN FLAG AND GOD BLESS AMERICA. COMES COMPLETE WITH STANDARD GROUND MOUNT HARDWARE.